The average price* of a single hearing aid is $2,372. Most people purchase high-end hearing aid technology from popular brands like Phonak, Oticon, ReSound, Widex, and Starkey. Consumers save money by shopping for hearing aids at Costco and purchasing lower technology levels. *Conclusions are drawn from our survey of over 2000 hearing aid consumers. Hi Abram, I'm updating my book Living Better With Hearing Loss, and trying to get a sense of the current hearing aid market, and the status of insurance reimbursement for hearing aids. I responded almost immediately, saying that I wasn’t aware of any good data. I also suggested that we should survey our respective followers to try to investigate and find some answers ourselves. Katherine agreed, and we began working on a survey. At some point, we also reached out to our friends over at the Hearing Loss Association of America, who agreed to survey their followers as well. Through our combined efforts, Hearing Tracker, Katherine Bouton, and HLAA were able to generate over 2000 survey responses, from respondents across every US state. We received about 10% more of our responses from women, and over half of our responses from hearing aid users in the 55-74 age range. Hearing Tracker, HLAA, and Katherine Bouton followers represent a unique highly-motivated group of hearing aid users. Survey results should be considered representative of this unique group of individuals, not a balanced group of average hearing aid users. We asked our followers about their pre-tax household income and current employment status, which helped us to get a better idea about our survey sample. The reported pre-tax household income for our sample lines up very closely with national averages, while the reported employment status of our sample is more in line with an aging cohort (more than half of the group is retired). We asked our followers about their hearing loss severity. The chart below shows four major color-coded groups, based on the worst hearing loss level reported. The darkest blue group (26.4% of the total) is profound at worst, while the lightest colored group is mild at worst. Our largest group was severe at worst (39.6%) followed by moderate at worse (31.1%). The smallest group (2.9%) had mild hearing loss at worst. In general, our followers are more experienced hearing aid users, with over half of respondents reporting over 10 years of hearing aid experience. A very common claim in the hearing aid industry is that the average person waits seven years (after learning they have a hearing loss) before purchasing hearing aids. This was not the case for our sample. Over half of our followers reported purchasing hearing aids within 2 years of learning they had a hearing loss. The discrepancy could be put down to sampling bias or issues with erroneous self-reporting. We asked our followers how many hearing aids they purchased (one or two), what brand and model of hearing aids they purchased, what level of technology they purchased, and what features their hearing aids came with. The bulk majority purchased a pair (84%) of hearing aids. This finding lines up closely with historical trends of binaural (both ear) fittings, as reported by hearing professionals. The concept of technology levels will be new for many readers. Generally speaking, hearing aids come in a variety of technology levels, with higher technology levels representing the cutting edge of what each hearing aid manufacturer has to offer in terms of features and functionality. As you might expect, higher technology levels come at a higher price point. We asked our followers which level of technology they purchased (top-end, mid-range, or low-end). The majority (54%) reported purchasing top-end hearing aids, about a third reported purchasing mid-range, and less than four percent reported purchasing low-end. Note: Some hearing aids come in more than three technology levels. The data below should be considered a very rough approximation of the buying trend. The results of our survey show that Phonak is the most popular hearing aid brand (among our sample), followed by Oticon, ReSound, Widex, and Starkey. Kirkland Signature (Costco’s white-label brand) came in just below the major brands. In the chart below, we have included any brand with at least 10 responses. For reference, 522 respondents told us they purchased Phonak hearing aids. We received a handful of responses for smaller brands like Audibel, Sonic, NuEar, EarLens, Eargo, etc, which are not shown on the chart. Our results are more or less in line with previous research from Bernstein Research (2015). According to Bernstein, Sonova, which manufactures Phonak and Unitron, had 30% market share in 2015. In our survey, Phonak and Unitron owners made up 26.7% of the sample. William Demant, which manufactures Oticon, Bernafon, and Sonic, had 21% market share in 2015. In our survey, Oticon, Bernafon, and Sonic owners made up 19.7% of the sample. The chart above shows market share for Siemens. Siemens hearing aids was sold to Sivantos in early 2015. Siemens hearing aids have been rebranded “Signia” by Sivantos. Oh, and prepare for more change as Sivantos and Widex have announced plans to merge. 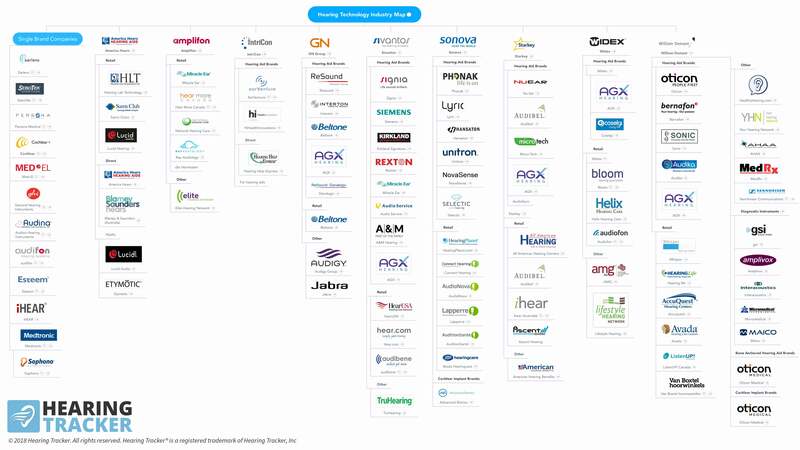 In the past, Hearing Tracker has provided a map of all the hearing aid brands to help consumers understand the industry. Click on the image for a bigger view. The overall average price paid for a single hearing aid was $2372. Purchasing hearing aids as a pair reduced the cost slightly from an average unit price of $2560 (purchased as a single unit) down to $2,336 (purchased as a pair). Hearing aid prices seem to vary little whether purchased from a name brand store (Miracle Ear, Beltone, Etc), ENT office, or audiologist clinic. In each case, the average price paid was just over $2500. Prices at university and hospital clinics was slightly lower at $2432, and the average price paid at Costco was substantially lower, coming in at just over $1200. Interestingly, internet purchases came in only slightly lower than Costco at $1054 per hearing aid. Hearing aids purchased on the internet either came with no in-person professional service or with limited in-person professional service, as contracted by the internet retailer. Internet purchases that included a professional fitting (websites like hearstore and ziphearing) averaged $1533 while purchases that did not include a professional fitting averaged $704 (audicus, ebay, amazon, etc). Note: In the chart below, we only included categories with at least 50 responses. Surprise, surprise! Those who reported purchasing higher end hearing aids also reported spending more, on average. Higher-end hearing aids came in at an average price of $2,651 per device and low-end hearing aids came in at about $1000 less, at $1,604 per device. Mid-range hearing aids came in at $2,063 per device. Starkey, Widex, Beltone (GN), and Oticon were on the higher end price-wise, all coming in at over $2600 for a single hearing aid. Most other brands came in at between $2300-$2500 per hearing aid, with Rexton and Kirkland Signature (Costco’s brand) coming in significantly less (closer to $1000 per device). Note: The prices shown below reflect the average private pay unit prices reportedly paid by our followers and may not reflect actual average prices paid within the retail market as a whole. The reader is also advised to consider the relatively low sample being reported, and in all cases should consult a local provider for realistic regional pricing. Of the hearing aid brands listed above, Phonak, ReSound, and Rexton have historically been available for purchase at Costco. In our sample, we received multiple responses from those who purchased at Costco (45 for Phonak, 40 for ReSound, and 39 for Rexton), and the data we collected suggests that there is an average savings of around $1000 per hearing aid relative to purchasing through traditional channels. Volume purchasing - Costco’s current estimated market share is 11% of all U.S. hearing aid sales. Low overheads - Costco’s “shop in shop” model means lower overheads compared to traditional brick and mortar shops. We also see (below) that Costco employs a higher ratio of hearing instrument dispensers, which could translate to lower average salaries for their hearing professionals. *After publishing our findings, we received feedback from a “Senior Hearing Aid Specialist at Costco” indicating that Costco is now selling (in some cases) current-generation premium-level hearing aids. Our contact also reported that some brand-name hearing aids have features stripped out, and that Costco does not sell certain niche products, like CROS aids. We also asked respondents to tell us whether a hearing healthcare professional was involved in their hearing aid fitting, and if so, whether that professional was an audiologist or hearing instrument specialist. In our sample, 75% of consumers were fitted by an audiologist, 20% were fitted by a hearing instrument specialist, and the rest either weren’t sure who fitted their hearing aids or reported that a professional wasn’t involved. The per-unit hearing aid prices reported were about $500 higher when a hearing aid was fitted by an audiologist versus a hearing instrument specialist (HIS). On the surface this makes sense; audiologists have a more in-depth education in the science of hearing and hearing loss, invest more in their education, and command a higher salary (on average). Who fitted your hearing aid? However, looking deeper into the data we found many hearing instrument specialists seem to charge the same amount as audiologists when the setting is the same. The lower prices seem largely driven by the higher proportion of hearing instrument specialists in the Costco setting as reported by survey respondents. Our survey placed 40% of hearing instrument specialists at Costco vs 4% of audiologists. Audiologists were much more likely to fit hearing aids at the local clinic level, including ENT, hospital, and university clinics. Consumers who were fitted at a name brand store had about a 50/50 chance of being fitted by an audiologist or hearing instrument specialist, and consumers who were fitted at Costco were more than twice as likely to be fitted by a hearing instrument specialist. Note: In the chart below, we only included categories with at least 100 responses. Wondering why hearing aids cost as much as they do? Check out what Dr Cliff, AuD has to say on the matter. He breaks down the costs associated with research and development and audiological service in a very understandable way. Hearing aids are expensive. However, there are some very basic things that you can do to save money on hearing aids. These are the 6 things you can do to save money on your next hearing aid purchase. 1. Call your insurance company. More and more insurance companies are adding coverage for hearing treatment and/or hearing aids and many insurance companies are using managed care companies to provide hearing aid discounts to their members. Just be careful with managed care; you may be able to negotiate a better price directly with a local clinic if you forego your managed care benefit. 2. Don’t upgrade your hearing aids. Get them re-calibrated. If you think the newest hearing aids will provide you a substantially better hearing outcome, think again. People generally only notice small improvements with each new technology that hits the market. Unless there is a major feature change that would benefit you directly, changing every 1-2 years is a waste of money. Instead, focus on finding a provider that can maximize the programming of your current hearing aids as your hearing changes. This includes re-checking your hearing and re-running Real Ear Measurements (REMs). For more on this, see When to replace your hearing aids. 3. Buy lower level technology. One of the benefits of continuous technology improvements is that older features make their way into to lower levels of technology. A well-programmed lower level set of hearing aids will mostly likely perform better than a premium level of hearing aids that aren’t programmed well (the fitting means more than the product), and premium technologies don’t always yield superior performance over basic ones. 4. Finance your hearing aids and spread your payments over time. Not everyone has thousands of dollars laying around to spend on hearing treatment. However, nearly every hearing aid clinic you find should have some form of low-interest or no-interest patient financing to make hearing aids affordable if you’re on a budget. Also consider looking into HSA / FSA accounts for tax breaks on hearing aids. 5. Buy your hearing aids online and get them programmed by an audiologist. If you can’t find a brick and mortar clinic that provides you an affordable hearing aid option, try checking online. While a hearing aid purchased online likely won’t give you the maximum hearing benefit, it is definitely better than nothing. You may also be able to have those hearing aids serviced by a local professional as well. If you are considering going this route, make sure you watch The 7 things you should know before buying hearing aids online, and know that some online retailers sell devices with no local face-to-face support, while others sell (often with the same pricing) the same devices with local support included. Again, the gold standard is to purchase comprehensive support and service from a local provider, typically included in a “bundled” hearing aid purchase. 6. Go to a clinic that unbundles the cost of devices from their professional services. Unbundled clinics separate the cost of hearing aids from the costs of services. This can help to curb the upfront costs of hearing treatment and let you pay for services as you go. While you will have to pay for each visit you make to the hearing clinic, you won’t be spending money on services you never receive. See a list of hearing professionals that offer unbundling in your area. Cost should never be a reason to forgo hearing treatment. With all the negative consequences of untreated hearing loss, you can’t afford to leave your hearing loss untreated. With these six ways to save money on hearing aids, you should be able to get hearing treatment at a price that you can afford. This is the first article in a multipart series of articles covering our hearing aid prices survey. In follow up articles we will be addressing hearing aid preference and recommendation ratings, insurance reimbursement, local service trends, and an analysis of accessory purchases. Subscribe to our newsletter to receive updates. Part 1 - How much do hearing aids cost? Also didn't see a discussion on feature upgrades, such as going to my old one (2006) to my current ones (2015) to the ones I'm looking at now (2019), which have rechargeable batteries. Having Parkinson's makes changing batteries a complicated business. Adding in Bluetooth and Internet technology is another value-added process that can improve your hearing aids.